The Democrats make their pitch to a new silent majority. Obama and co. have fashioned themselves into the party of common decency. Barack Obama delivers remarks on the third day of the Democratic National Convention at the Wells Fargo Center in Philadelphia. Nixon positioned his campaign, and the Republican Party, as the party of “normal” Americans, the party of the “silent majority.” Trump didn’t make this move, because he couldn’t. He’s a reality television star whose life was lived in tabloids, whose brand is the outrageous and nonsensical. He’s decadent, extravagant, and proudly contemptuous of modesty in any area of life. His majority, if he has one, is a loud majority and an angry majority, not a silent one. 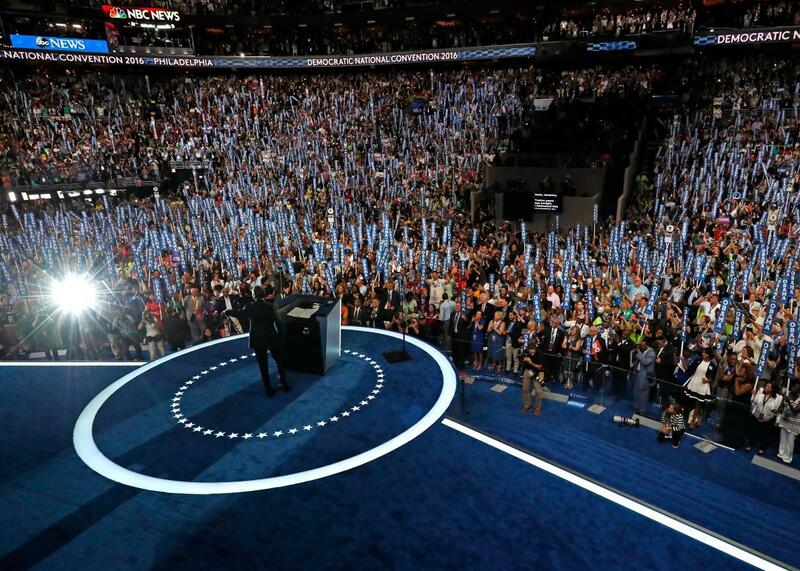 On the third night of its national convention, the Democratic Party worked to flip the script. Using a broad roster of speakers, from Vice President Joe Biden and vice presidential nominee Tim Kaine to former New York Mayor Michael Bloomberg, long-time national security official Leon Panetta, and eventually President Barack Obama, Democrats recast theirs as the party of normalcy and the champion of those decent people. But where Nixon spoke to a silent majority of white Americans, the Democratic Party wants to speak for a broad and diverse tapestry of blacks, immigrants, Hispanic Americans, Asian Americans, and the college-educated, especially among white Americans. It’s that last category of voters that got the most attention on Wednesday. From 1952 until 1980, Democrats held a disadvantage among college-educated whites. As the party of unions and the welfare state, they counted instead on support from working-class whites. But since 1980—and especially in the last decade—this has flipped. Increasingly, the Democrats’ most reliable white supporters come from the college-educated cohort, while Republicans find themselves with a large and growing share of working-class whites. You see this in the polls. According to the “Upshot” model at the New York Times, Clinton leads Donald Trump by 9 points among white women with a degree and 3 points among white men with a degree. Trump, by contrast, leads Clinton by 3 points among white women without a degree and by a whopping 14 points among white men without a degree. Democrats know they need to stanch the bleeding with working-class white men, and there’s a strong chance that Joe Biden, who delivered an intimate and arresting speech Wednesday night, will have that task in the fall. But they also see a distinct opportunity with college-educated whites and a real chance to widen the margin among college-educated white men and women. Kaine also took on this task, introducing himself as a pragmatic politician of faith and decency. Kaine, like Bloomberg, is pitched to those college-educated whites who crave normalcy and want to feel comfortable voting for Democrats. A modern-day silent majority, diverse and pluralistic. That’s the pitch. We’ll know soon enough if it works.